We here at Caffeineforge have dedicated a lot of posts to bad Kickstarters, be they boring or derivative projects, celebrity soak-fests, badly designed pages, or poorly thought-through project plans. Let’s be honest: the crowd funding scene is filled to the brim with non-starters and projects that are deep in limbo, so it’s really inspiring when a creator manages to deliver on every front. Here’s to a little positivity in our diet. A while back I made a remark in a post about how thrilled I was to get my physical copies of Evil Hat Productions’ incredible Fate Core and Fate Accelerated Edition. These two lovely books were the fruit of the then-biggest tabletop roleplaying game project, Fate Core. The project truly exploded, with stretch goals and add-ons galore, not to mention an extremely cheap all-digital buy-in price that kept getting better and better as more schwag was added to the pile. Frankly, the Evil Hatters were making a lot of promises and pulling in a lot of green. While it’s great to be hopeful, it’s so easy to become cynical when you hear about projects with lots of potential floundering under the weight of missed deadlines, over-promised stretch goals, and poor project management, and while I owned previously published Evil Hat games, and could vouch for the quality of their work, my assumption was that with such a mammoth undertaking for a small outfit, we’d see the all too typical cavalcade of delays. First came the digital and print releases of the core material, in quick succession and right on schedule, but just last week the digital release of nearly all of the stretch goals landed—on time and of the quality I’ve come to expect from them of the sinister chapeau. That is to say, nearly perfect. It was a very good week, and my reading list has grown quite long. More than that, Evil Hat had undertaken something I consider risky: they launched a second project while the Fate Core project was still awaiting fulfillment—their wildly successful campaign for Fate Dice. I don’t usually get behind projects when the creator still has promised work outstanding on another project. I think it’s a little gauche for them to divide their creative focus when they have promises to keep, but the allure of MOAR DICE compelled me to back it against my better judgment. And in a remarkable stroke, my shiny new dice that were funded months after the original Fate Core project, arrived just days after the digital releases became available to Fate Core backers. They couldn’t have timed it better—now I have dice to play all those killer new Fate games. Two projects. Managed simultaneously by a small, indie RPG publisher. And they come in on time, to an impeccable standard of quality. We are through the looking glass here, people. Seriously though, I think Fred and the Evil Hat family exemplify Kickstarter success. Not just the raising of funds—though they’ve demonstrated a knack for that—but in actually fulfilling their obligations to backers. Frankly, it’s amazing. Here are some of the aspects of Evil Hat’s approach to their projects that I think deserve special mention for the clear impact they’ve had on outcomes for backers. 1) Forethought regarding goals, stretch goals, and add-ons. Clearly, thought went into the capacities necessary to deliver not only on the project goals, but on the supplemental material as well. This meant building a network of contributors who were ready to act when called upon, and who were capable of adhering to a timeline. Not to mention, having the project management chops to build a timeline and get it right. Its human nature to be optimistic, but as every (good) PM knows, you take your optimistic completion estimate and add 20% more time (at least), to account for the realities of managing a distributed team doing thoughtful work. Someone(s) at Evil Hat knows what they’re doing. 2) Effective communication. I would say that Evil Hat’s projects have just the right amount of outbound communication. Not so little as to make one wonder what the effing eff they’re doing with our money, but not so much as to inspire loathing (or worse, make me disable updates). 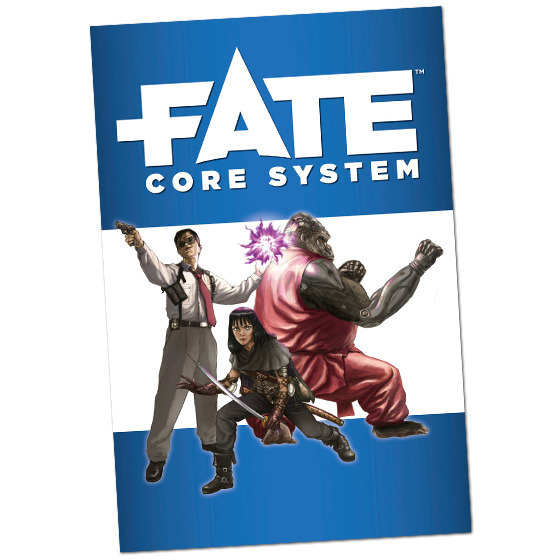 It’s a pretty careful balance, but they nailed with both Fate Core and Fate Dice, by sending timely, content rich updates about their process and their progress. 3) Exemplifying customer service. USPS still managed to ding your well-packed book? Have a replacement—and keep the original for your troubles. Even when it became clear that they had grossly underestimated European shipping costs, their solution was to communicate the issue, explain their course of action, and make it right. It doesn’t get a whole lot better than that. I won’t lie—I was a fan before I ever backed an Evil Hat project—but the way Fred and his team have managed to maintain quality, demonstrate professionalism, and put fans at the forefront of their process has made me a backer for life. Come on, Evil Hat. What’s next? This entry was posted by Chris Avery. I agree. The Fate Kickstarter has been a model for how to do something big, and do it right. It’s projects like theirs that keep me from being too worried when some other project looks like crap, or is a clear money grab, because THIS is what I come to Kickstarter for.